One of the main benefits of using Typescript is the consistency for you and your team. Angular has an overall framework that all start our the same way( all import then decoder and finally place code into class). This is always what is followed, and then one can add in more, such as adding in an interface. Angular also allows one to add re-usable codes quite simply. A style guide is also supplied so teams can be consistent in starting ideas for projects. And with the CLI tool, initial projects can be started with different features. You can also run tests with them and perform builds and lint codes. Refactoring with the CLI tool makes the process much faster and easier than it has been in the past. The compiler is able to catch errors before runtime. You are also able to mock test services, even using the same interfaces as the real thing. 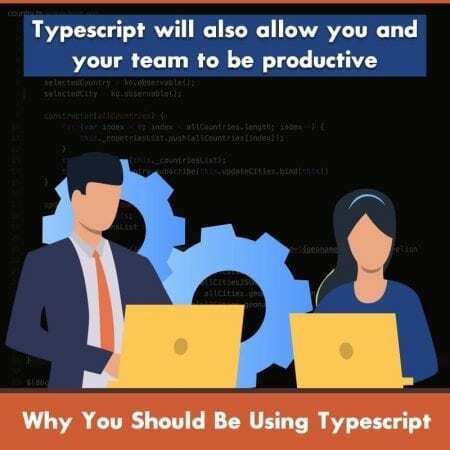 Typescript will also allow you and your team to be productive. As components and other elements are the same, those using Typescript will not have to worry about if they are using it in the correct way. You can write a component, then take another and use the same general guidelines. This means more work gets done in less time. Modules are a huge benefit to Angular. You need to organize all your codes. Each code can be placed in a module. Granted, some codes will fit into different modules. What is great about these modules is that they will make it possible to divide up the application in reusable chunks and features. Lazy loading can also be done with modules. Those that are wanting to develop a large coding project should consider using Typescript. It is simple to debug if there are problems, and the codes look simple and clean. You and your company will be more productive when Angular or Typescript is used, and there will be consistency throughout the projects. There are many other great benefits of Typescript. If you have a growing team, Typescript can really help. It is ES-next compliant, can enhance code quality, and makes the codes easier to read. Typescript can also be used on all browsers. If you do not have a lot of knowledge, you can still write codes with pure object-oriented coding. If you are uncertain about if Typescript is for you and your company, you should contact a professional that will be able to further assist you. Consider contacting IB Systems USA. This company can help you grow your company and assist you in all of your projects.